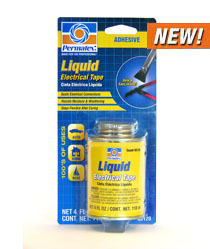 Weatherproof protectant for wiring and electrical connections. Goes on as a liquid and dries to a vinyl polymer that resists dirt, dust, chemicals, moisture, ensuring that connections stay intact. Brush top applicator allows coverage without gaps and enables access to tight spaces that roll tape and shrink tubing can’t get to. Suggested Applications: Ignition Wires, Underground Wiring, Outdoor Lighting Fixtures, Bilge Pumps, Terminal Blocks, Exposed Wires, etc.